I have noticed that there are several points to the Time Magazine article dated March 25, 2002 which have obviously been copied from my website and from my newsgroup postings. For example, the Time Magazine article says, "Last spring he staged a fashion show featuring flirty chess uniforms modeled by Alexandra Kosteniuk, a curvaceous grandmaster who may be the chess world's answer to Anna Kournikova." My website at http://www.samsloan.com/chess.htm in an article I wrote and posted on January 4, 2002 says, "Alexandra Kosteniuk is the new Anna Kournikova of chess". QUICK, NAME THIS SPORT: RIVAL world champions, a shady multi-millionaire commissioner, drug testing, boycotts and shapely young women parading around in skimpy costumes. If you said Professional wrestling, you get partial credit. The correct answer, of course, is chess. The governing body of world chess, led by its eccentric president, Kirsan Ilyumzhinov, has launched an all-out campaign to remake this most elevated of intellectual exercises into a fast-paced, high-stakes spectacle suitable for prime-time television. In the process, Ilyumzhinov is either rescuing chess or dragging it down to the level of Tonya Harding vs. Paula Jones, depending on your point of view. In the highly political, deeply petty world of top-rung chess, nothing is black and white. The story of Ilyumzhinov's rise to power reads like a James Bond movie scripted by Vladimir Nabokov. 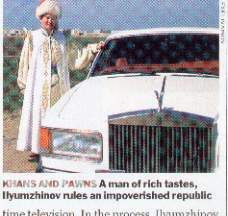 Like many other chess players, Ilyumzhinov was a prodigy. At 9 he was the chess champion of his native Kalmykia, a tiny, impoverished Russian republic populated by the descendants of Genghis Khan. But his talents went beyond pushing pawns. In his 20s he made millions running a string of banks in the early wildcat years of post-Soviet Russian capitalism. At the tender age of 31 the dapper Ilyumzhinov (he has a fondness for white capes and vintage Rolls-Royces) was elected President of Kalmykia. His regime has been dogged by allegations ranging from electoral irregularities and embezzlement of federal funds (an investigation a has been launched but no charges filed) to the 1998 murder of the crusading editor of an opposition newspaper (one of his former aides was convicted of the crime). In 1995 llyumzhinov took over the presidency of the venerable Federation Internationale des Echecs, FIDE for short, which curates the rules of chess and tabulates the world rankings. He immediately set out to reshape the sport in his own image. In an attempt to make chess more sponsor friendly, he compressed the traditional two-year championship schedule into a more dramatic three-week tournament. He sweetened the pot with liberal infusions of cash from his deep pockets and sped up the game clock, discarding the time-honored classical chess format, in which players spend hours elaborating intricate moves, in favor of rapid chess, an adrenalized variant in which each game lasts just 50 minutes. "Chess had to be commercialized. Investment had to be brought in," Ilyumzhinov insists. That must be what he had in mind when he staged the 1999 world championships at Caesars Palace in Las Vegas. 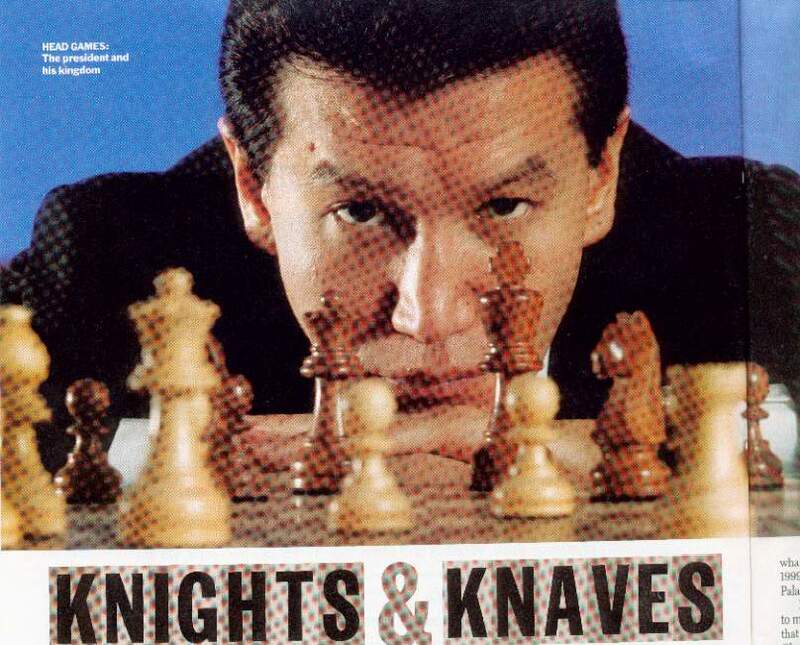 Ilyumzhinov also launched a campaign to make chess an Olympic sport, a process that will involve, as per International Olympic Committee regulations, mandatory drug testing. In Kalmykia's capital city of Elista, he erected a $30 million chess coliseum called Chess City, a bizarre extravagance in a place where hot water is still a luxury. Last spring he staged a fashion show featuring flirty chess uniforms modeled by Alexandra Kosteniuk, a curvaceous grandmaster who may be the chess world's answer to Anna Kournikova. Kosteniuk then proceeded to play eight simultaneous matches. On Rollerblades. "Apparently, in order to save chess, it must be destroyed," American grandmaster Yasser Seirawan observes wryly. Ilyumzhinov, naturally, takes a different view. "All is quiet in the chess kingdom," he says. "Everything is clearly structured. Everything is predictable and runs smoothly." Matters came to a head in Moscow last December, when FIDE and Kasparov staged simultaneous rival tournaments in the same city. Without either Kasparov or No. 2-ranked Vladimir Kramnik in attendance, FIDE ended up crowning an 18-year-old Ukrainian named Ruslan Ponomariov. Last week Kasparov gave the whiz kid the grandmaster of all spankings at a tournament in Spain. So who's the real world champion? No one knows. Few think Ponomariov has what it takes. But Kasparov doesn't have FIDE'S stamp of approval, and, besides, he lost to Kramnik in a non-FIDE championship match two years ago (since then Kramnik has managed to avoid a title re-match). "There's this terrible rift in chess", says Seirawan, who is also boycotting FIDE events. "The world chess championship is a disputed title." Seirawan, the top-ranked American player, may be the game's last best hope. One of the few voices of reason in a game full of mad geniuses, he has been circulating a compromise proposal: create separate world championships for classical, rapid and ultra-fast blitz chess and appoint a chess commissioner to mediate between players and organizers. His plan will be discussed at a players' meeting in Prague in May.